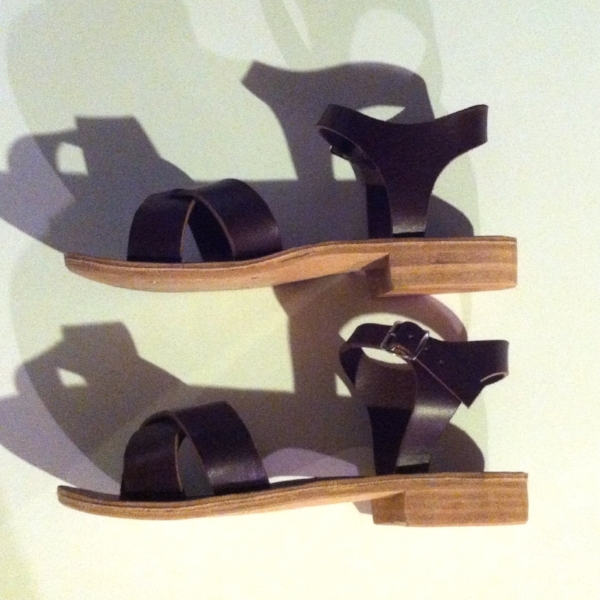 RACHEL SEES SNAIL SHOES makes simple, modern sandals- one pair at a time. RSSS believes in sustainable choices, working small, and empowering people to make their own shoes. Rather than creating just more products for the consumer market, I hope to make unique shoes that have a personal connection to their wearer. Whether you've made your own shoes in my class, or collaborated with me on a custom pair, I want my shoes to stand out as wearable art objects worn with pride and a knowledge of how they were constructed. About me. My name is Rachel Corry and I make sandals and shoes in Portland, Oregon. I teach sandal-making classes regularly. I believe that learning to make sandals is a great first step if you're interested in making your own shoes. Rachel Sees Snail Shoes began in 2010. Meeting a clogmaker in the UK first sparked my interest in shoemaking but it wasn't until a fire in my apartment burned all my shoes (!) that I set out to learn to make my own, working to replace my favorite sandals, one pair at a time. I drew upon the wisdom of various shoemakers, cobblers, and old books to help me along my way. Ill be spending 2019 writing a Sandalmaking book (!!) but you can still find me teaching classes on a monthly basis. Visit me at my Studio to see examples of my work or discuss a custom pair. Here you can find a small selection of my handmade shoes as well as Sandal-Making Kits. I'm in the Yale Union building, at 800 SE 10th Ave, at Morrison. Custom pairs Im taking a hiatus from making custom shoes so I can work on writing a Sandalmaking book! Normally you would choose a design from my previous work and email me about variations including color, heel height, or other specifications. It's not necessary to do an in-person fitting, but if you live in Portland, I recommend stopping in. Prices start at 300. Workshops are scheduled about 4 times per month and can be found on my classes page. In addition to these dates, private classes can be arranged at my studio at any time by emailing me. If you'd like me to visit your town, please email me with venue suggestions. I occasionally host my class through Airbnb Experiences- those available dates can be found here. Visit Portland! Ive made a list of my favorite restaurants, shops, and things to do regarding art, film, and nature. If you visit to take a class, use this to help you plan your visit.